If you love the arcade, shenanigans, crazy sounds and the action of a shooter, look no further than High Hell. You may want to put on a helmet and a good pair of shoes, though, as you should prepare for a return to 90’s era gaming. Made by Terri Vellmann (Heavy Bullets) and Doseone (Enter the Gungeon, Gang Beasts), developed by Beast Cartel, and published by Devolver Digital, Bullet Hell makes for a flashback to simpler times. Picture yourself fighting corruption with an arsenal of shotguns in a loopy environment that’s reminiscent of a NyQuil hallucination. Run through a drug lab, and accomplish mission objectives. You have now entered “Pitchcorp,” the twisted land where you do your bidding. The plot? Definitely out there, but that is part of High Hell’s appeal. Each level has a stated objective. Accomplish it and you move on to the next challenge. Fail and you are stuck in a loop of despair while the AI mocks your inadequacy. Over and over again. In terms of options, High Hell gives a plethora of options for graphics and sound. The physics here are NOT life-like but they get the job done and mesh with the arcade feel. To get to the key binds for customization you have to boot the game while pressing the Ctrl key. This is the only way to access the option. This allows for some customization, although options here are quite basic. High Hell has the fast pick up and play of an arcade-style shooter and the addictive quality that makes you want to give it just one more try to see if you can get past the crazed villain that just busted a cap in yo… well, you know. Shiny graphics, crazy sounds and a bizarre storyline involving drug labs, villains, and yes, chimps, are just the beginning of what High Hell delivers. It’s marvelous mayhem with a soundtrack to motivate, with rapper/producer Doseone behind it. The sound combined with the shiny retro graphics immerse in a fast-paced nonsensical arcade action. You never know what will be behind the next door you kick down (the only way to get through a closed door, you know), and there is no quietly slipping into a room as ‘they’ are already there awaiting your arrival. Then is the fact that multiple levels offer no health pickups. So play like you will never see a health kit… and you’ll be good. As far as weapons; you have a shotgun. It never runs out of ammo and there are baddies galore to shoot up. In fact, the baddies have this special way of staring at you with their expressionless faces after they kill you. It will make you want to keep on playing so you can shoot them to bits. Every 5 levels you will encounter a mini-boss that wants to thwart you on your path to conquering evil. Now you’re getting it: meet the objective, shoot up a mini-boss, quest onward. The total adventure takes you through 20 levels and the experience may be completed in a few hours. For those that play it in pieces, it may last just a bit longer. For those more advanced, the intent is for you to get it done in under fifteen minutes. Yes, 15 minutes for twenty levels. The clock is ticking and it’s all up to you. This is a speed runner’s style of a shooter game. You decide, stay and shoot up all the bots for extra points, or pass through and complete the level. 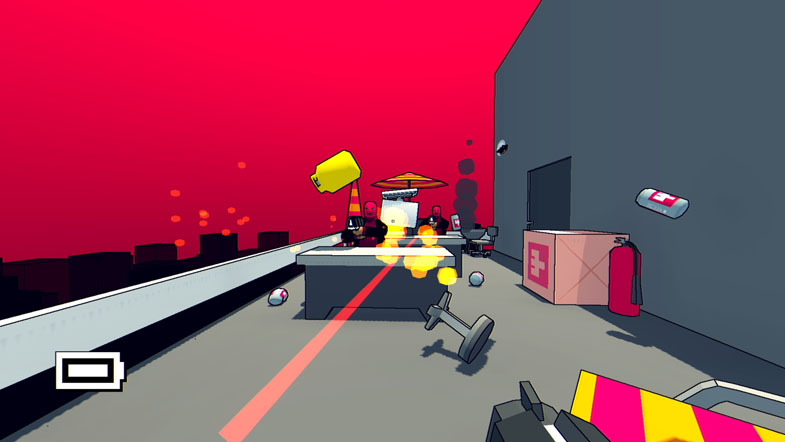 Armed with your shotgun, no reloading to worry about, run, jump, and crouch, with the left trigger activating a zoom for long-distance aiming. You have a button to kick down all doors, as well as adjustable mouse sensitivity. 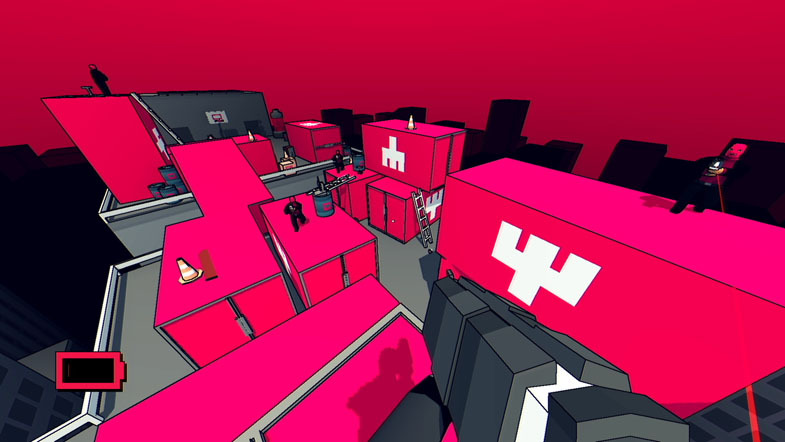 High Hell is addictive, shiny and cool sounding, and you get to shoot bad guys with unlimited ammo. It’s not complex, evocative or fancy, but on the other hand, it’s highly re-playable, fast to pick up, and addictively fun.